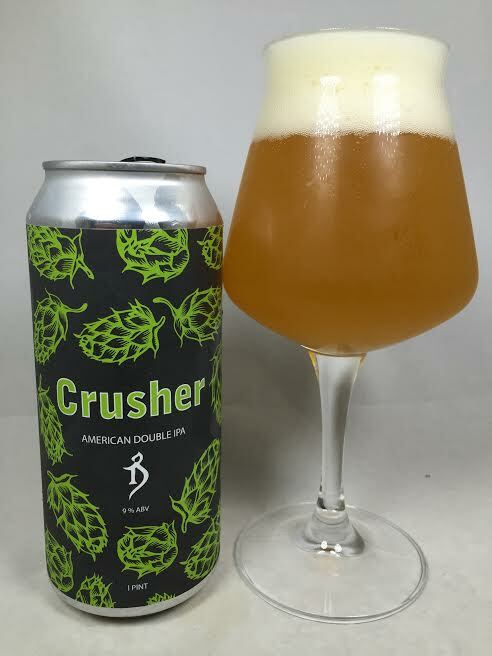 "The Crusher is an American Double IPA that I started making years ago at the old pub. Hop heads were constantly asking for more hops. So, in the words of Frank Zappa, "Did you say you want some more? Well here's some more." While I enjoy hops with the rest of them, I still try to maintain some semblance of balance and drinkability. This beer is oozing with hop flavor and aroma with a very dry finish. Enjoy responsibly, this one can sneak up on you." Number Two of this week's Alchemist reviews is another highly-rated DIPA from this brewery. As I said yesterday with Focal Banger, Crusher (or The Crusher...whatever) has only been available to take home via those whacky pop-up sales. With the opening of the new brewery, you can now (temporarily) grab your allotment of cans of Crusher. This is one that I had never tried before I traded for a couple of cans, so I am going into this with no prior experience. The Youtube community has hailed this one to be even better than Heady Topper, so I guess there's no pressure going into this one, is there? Pours a hazy light orange with two fingers of white head and noticeable sediment sitting on the bottom of the glass. The aroma has resinous hops with a sprinkling of boozy heat. Fruity notes of clementine and acidic citrus also hold a big presence. Fresh, wet, hop oils come forward too. I think the first thing I notice on the taste is how sweet the beer is. It's not an overly malty mess, but I was taken aback by how sweet it was when it first touched my tongue. Moving (quickly) past that I see that (like Focal Banger) the fruity notes are bigger on the taste than they were on the aroma and they are almost explosive at times with pineapples and mangoes leading the charge. Giving the beer some time to warm up yields just the smallest bit of cherry or strawberry. The back end produces some tree bark, but nothing I'd call piney or spruce-like. The finish has an overall aura of earthy qualities and a resinous hop feel. Mouthfeel is as big as you'd expect a 9% DIPA to be. It walks a fine line between Double IPA and Triple IPA status, but it stays on the Double side of things as the hops, while big and bold, don't overload the palate and make the beer hard to drink. Not that this is something you want to gulp down quickly either, but this is still smooth sailing thanks to the influence of the fruity hops. Some slight heat on each finish is here, but the 9% is kept in check nicely. Alchemist Crusher wasn't the juice nuke that New England is famous for, but as a DIPA it still worked effectively. It had its moments of overpowering resin, but the fruity hops outweighed the spicy and dank hops enough to create a drinkable DIPA that pleased both the juice bomb fanatics and the traditional DIPA fans. It reminded me of the Stone Enjoy By Unfiltered DIPA, but I think the Stone beer was executed better. You can call this beer a more subdued version of Stone Unfiltered, but this is still good on its own merits.